What is a CO2 Reduction Certificate? How do I chose the amount of CO2? What is equivalent to 0.1 tons of CO2? What is equivalent to 1 ton of CO2? What is equivalent to 2 tons of CO2? What is equivalent to 5 tons of CO2? What is equivalent to 10 tons of CO2? What is equivalent to 50 tons of CO2? What is equivalent to 100 tons of CO2? What are the preconditions existing in the metaphors listed for certificate amounts? What is a CO2 Reduction Certificate? Is it the same as Carbon Offset? What is a Carbon Offset Certificate ? What is the differenct between a CO2 Reduction Certificate and a Carbon Offset Certificate ? On what grounds are you issuing your certificates? Can we use CO2 reduction certificates for carbon offset purposes? Who owns the CO2 reduction certificates? How do you guarantee the validity, accuracy, persistence of the projects that generate the emission credits ? What kind of measures do you take to ensure clarity of your actions? Are you one of those providers who just issue certificates without processing emission credits? Why do the prices of your products change quite frequently? Can I buy a certificate without having it disclosed? Do I have to disclose my real name if I purchase a certificate? Are green house gas emissions really reduced by purchasing your certificates? What is a Sub Certificate? How is a Sub Certificate issued? Why did you create a Sub Certificate? What measures do you take to prevent injustice and forgery of Sub Certificates? Why are different animals printed on the T-Shirts and Stickers for different amount certificates? Are there any other sizes or colors for the T-Shirts? What does cancelling an Emission Credit mean? What does retiring an Emission Credit mean? What is the difference between cancelling and retiring Emission Credits? Why is the application date and transfer date different in the Credit Disable Documents? Why are you transferring the Emission Credits to the Japanese Governments account and not directly to the Cancellation/Retirement accounts? Why are there no stamp duties pasted on the application form? Where can I see the documentation that you have really processed the emission credits? What should I do if I find any mistakes or errors on this site? Please refer to the comparison expressions for the available amounts. The average per capita emissions of 2 days of an American , 3.5 days of a Japanese , 9 days of a Chinese or37 days of an Indian. Cedar tree carbon sequestration per year in an area of 2 boxing rings. The average per capita emissions of 2.5 weeks of an American , 5 weeks of a Japanese , 3 months of a Chinese or 1 year of an Indian. The average per capita emissions of 5 weeks of an American , 2.5 months of a Japanese , 6 months of a Chinese or 2 years of an Indian. The average per capita emissions of 3 months of an American , 6 months of a Japanese , 1 year and 3 months of a Chinese or 5 years of an Indian. The household emissions of an average Japanese family. Cedar tree carbon sequestration per year in an area of half a soccor field. The average per capita emissions of 6 months of an American , one year of a Japanese , 2.5 years of a Chinese or 5 years of an Indian. The emissions of an average Japanese. Cedar tree carbon sequestration per year in an area of one soccor field. The average per capita emissions of 2.5 years of an American , 5 years of a Japanese , 12.5 years of a Chinese or 50 years of an Indian. The average per capita emissions of 5 years of an American , 10 years of a Japanese , 25 years of a Chinese or 100 years of an Indian. The metaphors exist as an example only. The average car is calculated as a car with a fuel economy of 10[KM/L] or 10[L/100km] or 24[MPG]. Volume metaphors are selected from CO2 being 509[m3/ton] at ideal gas state. Forestation figures are calculated from the fact that cedar trees 50 years old hold an average of 170 tons of carbon captured per hectare. Source : Japan Ministry of Agriculture, Forestry and Fisheries website. A CO2 Reduction Certificate is a Certificate that proves that you have reduced Green House Gas Emissions which cause Global Warming. Please refer to this page for details. A Carbon Offset Certificate is a Certificate that proves that you have Retired Emission Credits and have helped the Country of Japan to achieve its Kyoto Target. A CO2 REDUCTION CERTIFICATE proves that a certain amount of Emission Credits have been CANCELLED by the owner. On the other hand A CARBON OFFSET CERTIFICATE proves that a certain amount of Emission Credits have been RETIRED by the owner. Please refer to the question What is the difference between cancelling and retiring Emission Credits? for a more detailed explanation. We first create a Certificate Source by retiring or cancelling high quality emission credits such as CERs(Certified Emission Reduction). We attribute a proportion of the Certificate Source as Certificates to users who purchase our products. You will see a more detailed explanation on the rules in our Terms and Conditions page. 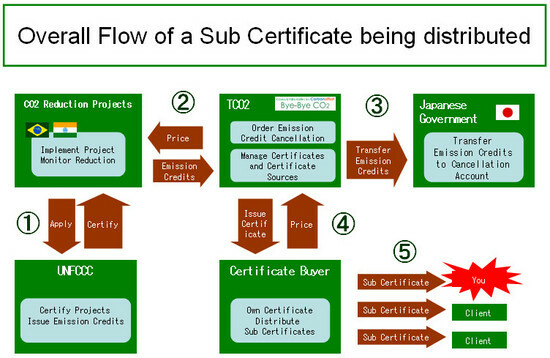 Please view the following figure that outlines the flow of issuing a certificate. By flowing right to left it shows how emission credits generated from projects change into Certificates. Please view our Terms and Conditions page for a further detailed explanations. To see a list of holders click here. We use CERs ( Certified Emission Reduction ) which are Kyoto Protocol Compliant Emission Credits as our certificate source. Yes we do. We disclose ALL certificates issued from us online with a unique ID, amount, and issued date to minimize the risk of double counting. We disclose ALL emission credit transfer history logs and paperwork alongside with ALL issued certificate to provide maximum clarity. We also plan to disclose the results of a third party audit report from next year. No we are not. Different from most offset providers, our rules are to segregate (cancel/retire) the emission credits BEFORE we issue any certificates. This assures the security of the process of certificate issuance. The price of Emission Credits used to issue the certificates change according to the market. Those price changes impose a direct effect to the products that we provide. No you cannot. ALL Certificates must be disclosed online. If you purchase a certificate that has cancelled emission credits it means that you have actually reduced emissions. Retiring emission credits is somewhat controversial　and depends on how some Japanese people view the relationship of Japan and the Kyoto Protocol. Please refer to the question What is the difference between cancelling and retiring Emission Credits? for a more detailed explanation. However please note that all of this will only have a meaning within the framework of the Kyoto Protocol. A Sub Certificate exists to divide an ordinary Certificate into smaller lots such as units of kilograms. A Sub Certificate will have a 14 digit ID ( Ordinary Certificates have 8 digit ) "*" mark on its weight. The following shows an easy flow describing the steps to how a Sub Certificate ends up in your hands. 1-(1) CO2 Reduction Projects are planned and executed. 1-(2) The "United Nations Framework Convention on Climate Change" or UNFCCC will review and register this project and issue Emission Reduction Credits. The figure bellow shows the flow. We originally provide certificates with a minimum amount of 0.1 tons. But many requests requesting Certificates in smaller portions such as killograms for distribution purposes has resulted in the creation of "Sub Certificate" which is created by dividing ordinary Certificates. The Sub Certificate still holds the same clarity and accuracy and reliability of an ordinary Certificate. If we completely delegate the right to issue Sub Certificates to the owner of a Certificate, then the owner might issue as many Sub Certificates as he/she wishes. For instance an owner that owns a 100 kg Certificate can (deliberately or by mistake) issue twenty 10[kg] Sub Certificates equating to 200[kg]. If he/she distributes them separately, there is no way of nowing as long as we can collect more than 10 Sub Certificates together. For security purposes we have decided to distribute Sub Certificates with the following 3 constraints. These three constraints will bring about the following effect. The allocation of a unique ID to every Sub Certificate and disclosing its information, will provide the same reliability and accuracy of a Certificate. This logical approach has a sufficient preventive effect to any possible problems that may occure. We apply copyguards where applicable to our printed products such as business cards or stickers. The weight of the printed animals onto T-Shirts & Stickers equates to the certified amount you have purchased. It means that nobody including countries can use those Emission Credits to justify their emission. Retirement of Emission Credits are done to achieve reduction targets. For example if you transfer your credits to Japans retirement account, those credits will be used to achieve Japans target. In other words, those credits are used to offset Japans emissions.
" I acknowledge the Kyoto Protocol as an effective treaty to tackle Global Warming. I support the Japanese government’s environmental policy fully despite the fact that carbon emissions have grown over the past 10 years. ( I also feel that despite Japan having the most advanced energy efficiencies in the world, it has committed to an unjust target, set politically, and am proud of the fact that Japan has not exited the Kyoto Protocol as the U.S has. ) I understand that my actions contribute only to the reduction targets of the Japanese country itself and when seen from the Kyoto Protocol framework itself or from people out of Japan, I have not additionally reduced GHG emissions.. "
" I acknowledge the Kyoto Protocol as an effective treaty to tackle Global Warming. I further support the UNFCC CDM projects carried out in developed countries. ( From a macro perspective I hope that cancelling emission credits will cause higher market prices of emission credits and lead to more cost effective GHG reduction projects executed all over the world.) I understand that my actions mean that I have additionally reduced GHG emissions when viewed from the Kyoto Protocol framework. However I also understand that I have not contributed to the reduction targets of the country of Japan. " Currently products on our site that have a name of "CO2 Reduction Certificate" will mean that they were issued on the bases of the cancellation of emission credits. We regard using the term "Reduction” for a retired emission credit will fall under the definition of double counting. The reason for this is that the emission credits will be used once to reduce the emission of the individual who has purchased the certificate and used the second time to meet the reduction targets of the country of Japan. In this case we have a contradictory situation where the certificate owner will regard that he/she has reduced GHG by himself/herself. But at the same time from a higher point of view, GHG as a total has not been reduced any more than the initial reduction target set for the country of Japan. For example, if Billionaire Mr.B decided to buy 50 billion USD worth of emission credits at 40 USD/ton, the total amount of credits would be 1.25 billion tons. This is almost the same as the annual total emission of Japan in 1990. Anyway if Mr.B was to put 0.75 billion ( 60% of what he owned ) into the Japanese governments "Retirement" account, the country of Japan will have met its target instantly without any further reduction efforts. In this case Mr.B would think that he has reduced 0.75 billion tons for the sake of global warming, but viewing from the Kyoto Protocol, we have only met Japans initial target, and Mr.B has not additionally reduced 0.75 billion tons. The precise expression of his actions would be that Mr.B has paid tax in Emission Credits on behalf of the people of Japan. On the other hand what would happen if Mr.B had "Cancelled" the 0.75 billion tons of emission credits he owned? The entities who needed those emission credits to meet their targets ( Including the country of Japan ) will have to reduce emissions within themselves or implement more projects that generate emission credits or abort the target itself and drop out from the Kyoto Protocol as the United States has done. We hope you have been able to further your understand about the difference between "Cancel" and "Retire". Compared to doing nothing, when an individual or an organization will either "Cancel" or "Retire" an emission credit, they both are precious actions when seen as a performance. However, one should keep in mind that the actual meaning and stance will differ when seen from inside and outside the country. The reason why we use "Cancel" as the default method is, first of all we do not believe that the Kyoto Protocol delivers the necessary speed to tackle Global Warming. Secondly, we believe that a global problem needs more people who share a global view and the sense to resolve this problem. There are already enough people that speak for their country or region. Finally, please note that we do not deny the concept of "Retire" and are open to those requests too. It is because the Transfer of Emission Credits among accounts within the Japanese registry take about 2 weeks from the application date. Because we cannot directly transfer emission credits to Cancellation/Retirement accounts. According to the Ministry of the Environment Climate Change Policy Division Global Environment Bureau of Japan, if we want to either cancel or retire emission credits, we must transfer the credits once to the government’s account where the credits will wait for a few months to half a year to be transferred to their final destination. According to the Ministerial ordinance for administering accounts in the National Registry System, whenever emission credits are transferred to the governments account for free (including purposes of credit retirement and cancellation ) the fee for transferring is exempt. You can download the documents in PDF format in the "Credit Disable Operation List" section of the "Certificate Source Detail page". Please send the following information through our Contact Form. (1) Your Operating System (2) Your Browser and version (3) The title of the page or the URL of the page that has a problem (4) A description of the problem. We will use the information you have sent us to improve our site. Thank you. No it is not. This service is provided as Beta. Although we will put in our best efforts to fix various problems it is not guaranteed that this system will be free of errors or mistakes. Please see the Acknowledgements page.